It’s nearing end of October; it is that time of the year when the school admission process is in full swing in Bengaluru and many parents are trying to find schools that will work best for their children. This article provides a checklist of criteria to look for before narrowing down on schools. This guide is primarily aimed at parents looking at Montessori and Kindergarten admissions. How does one go about figuring out the “right” school? Your precious 4-year-old probably gives you very little clue about his or her preference. The logical way of going about school-hunting is to consider the various criteria on hand, pick what you think are absolutely essential for your child and try to find schools that meet the criteria. And most importantly talk to parents whose children are studying in schools you are considering. Parents queue up for their wards’ admissions in front of National Public School. Pic: Chitra Aiyer. Commute distance and time: One of the criteria that has been on the list of every parent I spoke with was the commute distance. Bangalore traffic is not user-friendly, and definitely not children-friendly. Some parents are extremely particular about the school being really close by, and some are not so particular if the transportation is taken care of. Anita Murthy, a mom to a 6 year old said, “I wanted a school that was nearby and that was good.” Clearly for her, location was the top-most criteria. She works as a freelance consultant from her Koramangala home and chose National Public School. Academic standards: While this used to be the only criteria probably for most parents in the 70s and 80s, things have changed a lot now. Some are absolutely sure that academics is the prime factor of consideration in a school and some others don’t seem to think so. The former, even as they understand the need for a wholesome development of the child, are more willing to take that upon themselves as long as they know academics will be delivered at school. The second set of parents seem to completely believe that schools must be more like personality development centers that cater to the child’s development in totality while not compromising on the academics as well. Along with academics, they would want the child to have dabbled in art, music, theatre, community service, sports including swimming, tennis, chess, and some form of martial arts too. In Poonam Kuruganti’s words, “I owe most of what I have come to have to the education I had. The rigor of my early years of education made all the difference to my approach to higher education and what I went on to do. So, yes, academics was the prime factor while considering schools.” She is a post-doc scientist who went to the US for higher education. She and her family returned to India last year from the US. School fees: These days, school fees are very expensive and are like nothing we saw ever before. Many schools charge fees that vary from a few tens of thousands to a few lakhs of rupees per annum. Some schools also charge a one-time donation fee at the time of admission and some of these schools do not give receipt for all of the money collected as donation. If you are not comfortable with such a practice, then you must find out beforehand if the school you are trying for is transparent with all the fees it will collect from you. Some schools have varying fees for different students depending on the parents’ affordability. Some schools also have quotas for children from the not-so-well-off economical background. While affordability is in itself a criterion, you may also want to consider the kind of peers that a child is likely to have at school. A school’s fee structure also influences what background the students come from. Students-to-teacher ratio: Different parents seem to have comfort levels with different ratio numbers. Some parents are comfortable with students-to-teacher ratio of 40:1 and there are parents who prefer if this ratio is as low as 20:1. This is a personal preference. See what would work well for you child. Some kids will do well no matter what. Minakshi Garg is a teacher at Headstart Montessori who has an 8-year-old daughter and a 5 -year-old son. The daughter goes to an old convent school where she is one of the 60 students in her class. The son goes to a Montessori where the students-to-teacher ratio is 10:1. Minakshi says that her daughter is now a confident child who has found a way to be seen and heard in a crowd. Her son, she says, is a child who is blossoming under personal attention and care. He gets his own space at school and can learn at his own pace. Good teachers: Good teachers who enjoy their job, and acknowledged by the management with good pay are an important factor. The teacher who deals with your child is very important in your being satisfied with the school. A good school doesn’t always mean all good teachers. Narayanan. B, an executive at one of the MNCs here in Bangalore, says, “My son’s second std teacher was awesome, but his fourth std teacher has made me wonder why I even admitted him to this school.” This sentiment is not school specific; these words summarize what you hear from a lot of parents in the city. School management: While it is the teacher that your child will be interacting with on a day-today basis, it is the school’s management that is responsible for the school’s policies, value systems, the school’s attitude and the like. School management can be anybody – educational trusts, realty corporations, spiritual organisations, or a bunch of people who got together to start a school. One way is to check on what the management is capable of delivering is to look into its track record. For the newer schools, though, it is more of a gut call. School boards: Many of Bangalore’s schools now offer national and international boards of education in addition to the state board. ICSE, CBSE and SSLC are the Indian boards and IGCSE and IB are the international boards that are available. Different boards address the different needs of parents. At Citizen Matters, we had published a detailed article, ‘Which school board for your child?’, which details out the different boards and how they differ from each other. Corporal punishment: Old India believed in corporal/physical punishments. It was not frowned upon if a teacher beat his/her pupil. But now, things are different. Parenting has undergone huge changes and many parents do not believe in physically punishing their child. The good thing is that a lot of the good schools subscribe to the ‘no corporal punishment’ policy. It may however be essential for you to check with parents of a particular school. Better to know this before-hand from firsthand sources rather than being caught unawares during an academic year. One of the reasons Shilpa Shetty, a practicing architect based in Raj Mahal Vilas Extension, moved her son away from his old school was the physical punishment meted out there. Her son who has never been hit at home by his parents was hit at school and she knew this had upset her son a lot; he was all of five. That is when she realised a change was essential and she quickly hunted for another school for his first standard and homed in on Vidya Niketan. Parent participation: Some schools have active Parent-Teacher Association (PTA) meetings and some don’t. If PTA meets are essential to you as a parent, then check if the schools you are considering offer PTA meets. If they don’t, check to see if they offer parent-teacher meetings on a more individual level. When to admit: One other factor to keep in mind is if you are a parent who is keen to admit your child into a sought-after school, it is then best to seek admissions at the Montessori 1 level or at the nursery level. If your child gets into the school of your choice at this stage, he/she/you are spared of the hassle of getting into a school when the child is older. Getting a seat into any sought-after school after the first stage isn’t easy. Very likely, the child has to first qualify to write a test, then write it, and then make it to the cut off. All of which can be stressful on you and the child. One school may not cater to all your needs. See if the criteria that you think are essential are addressed by the school; you may have to let some other things go. And keep expectations realistic. You are welcome to participate in the discussion by using the comments section. Do let us know your thoughts. While there was panic outside the Chinnaswamy stadium last week after explosives were found, emergency exits within the premises were locked until the match was over. 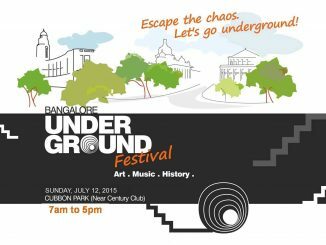 “Art Bengaluru 2010”- Bangalore’s contemporary art festival was a-five-day program with an on going display of work from different galleries in UB city. I came across a wiki kind of website focussing on Bangalore schools. The best part is that anyone can add/edit information/experiences they have had about any of the schools in the website. This can be quite beneficial to all of us who are struggling to find a good school for our children. These Schools are very arrogant and get sadistic pleasure by putting Parents to great inconvenience by making them to stand in Queue.Why cant they ask Parents to submit applications via the net.Bangalore is supposed to be IT city and cant these Schools have little common sense in making a little adjustment.Why anybody should stand in Queue for hours that too to get a an application its just ridiculous.